Neralie reveals the new polished stone slab in Structure Fourteen. While removing the rubble near the end of the central east pier in Structure Fourteen, in the closing hour of today’s work, Neralie discovered another star find – a beautifully polished stone slab, similar to a red one discovered in Structure Eight last year. But this is not all, as it sits on a small, but sadly broken, incised stone slab. Rather than leave it in situ overnight, the new find was quickly photographed, recorded and planned before being safely removed. Meanwhile, if anyone at the Ness wanted to know what really characterises Orkney weather, today was the day to find out. The wind blew, and blew, and then blew harder. Paradoxically, it wasn’t too bad in the trenches. Hunkered down on your knees, a good deal of the force of the wind whistles above your head. Up on the viewing platform, with the visitors, was quite a different matter. The wind caught words and whirled them away like scattered sand northwards but, to their credit, visitors stuck it out, even if the knuckles clutching the scaffolding poles looked a little white at times. Back at trench level, the archaeology was sparkling as usual. 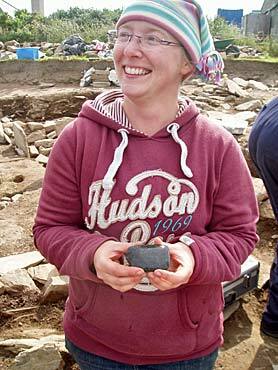 Sarah with her fine polished stone axe discovered under the west dresser of Structure Ten. 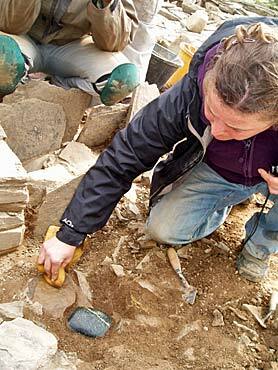 In Structure Ten, Sarah had been cautiously dismantling the west “dresser” but, just as the weather began to worsen, she found the most beautiful polished stone axe tucked into the foundation material. It is black and very shiny and appears to be a form of granite, possibly Labradorite, which is not usually used for making axes. Professor Mark Edmonds explained that it had been originally longer but had broken and had then been turned around and a new cutting edge had been worked. It is a well-used tool and had clearly been someone’s favourite implement for a long time before being carefully and deliberately deposited under the dresser. There is a degree of unhappiness with the term “dresser”, which is really more of a signifier than a description of use, but this discovery enhances the esoteric nature of their presence in Structure Ten. Sarah, needless to say, is ecstatic and describes it as her best find, ever. Elsewhere in Structure Ten, work continued following the robber trench and the indications now are that Nick’s suggestion of an original square form for the interior of the structure are correct. 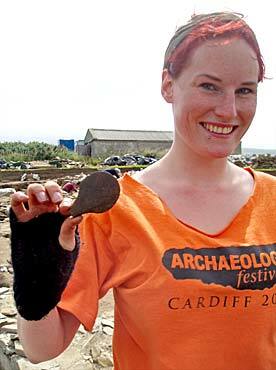 Emily displays the fine polished stone spatula from the levelling deposits under Structure Seven. One of the distinguished visitors on site today was Professor Taniguchi from Tokyo University. Professor Taniguchi is taking a few days from his sabbatical year at UCL to visit Orkney and the Ness. He is famous for being the finder of the world’s oldest piece of pottery, from the Jomon period in Japan, and will give a talk on Jomon pottery at the St Magnus Centre, Kirkwall, tomorrow, Tuesday, August 14, at 7.30pm. 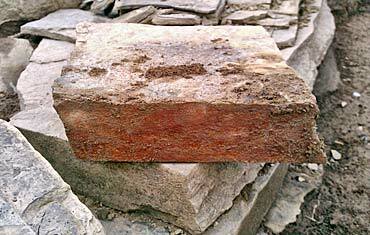 The word “Jomon” means something like “cord marked” and is descriptive of the pottery decoration. It is fascinating stuff and everyone is welcome. Another beautiful find came from below Structure Seven, where Emily uncovered a quite superb stone spatula. The head is spherical in shape and smooth, and the handle is missing. To those familiar with them it looks something like a metal razor from the Iron Age, but this little implement may well have been used for smoothing and shaping something soft and plastic, such as clay vessels. Elsewhere, in Structure Fourteen the removal of the rubble deposit sealing the floor is progressing, showing more evidence of the internal furnishings including threshold stones and orthostats. Seb investigates the NW recess of Structure Twelve. In Structure Twelve, Seb is investigating the interesting north-west recess next to the north wall, which may be a blocked-up entrance. The ashy dumps sealing the original floor are also being removed and the possibly multiple phases of remodelling of the curious north wall are also becoming clearer. In Structure Eight, Dave has conducted a photo session on the rubble infill and, hopefully, may soon come down on the tile horizon. 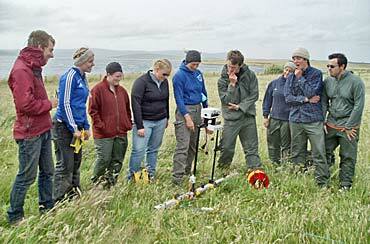 The Willamettes are being introduced to the beauties of geophysics, which will give them endless hours of fun. The area being covered by refined resistivity should illuminate the nature of the entrance through the Great Wall of Brodgar. The weather forecast for Tuesday is appalling and not much better for the rest of the week, so fingers crossed for our beautiful site. New painted stone discovered by Andre last week. My role is to help the students of all types with their time on site. This student group includes the MA students of Orkney College UHI, the BA archaeology students of UHI and I’m also liaising continually with Prof Scott to help the US students who are here through the Willamette University field school. I seem to rove around the site endlessly moving from one person to another, generally trying to make sure that the students are taking and receiving opportunities to get a wide range of experiences that will stand them in good stead in future projects and their careers to come! One thing that I get to notice while I’m on site is just how incredibly receptive both the students and the site supervisors are with the idea of fulfilling this educational remit. For one thing it makes my job very easy when all the staff on site seem to readily appreciate the value and importance of the presence of the students whilst the students themselves are incredibly committed, hard-working, and perhaps most importantly: very thoughtful as regards their part in the excavation process. Of course, this is partly an outcome of just how fantastic the site is. Mary Saunders, of ORCA Geophysics, explains the resistance equipment to some of the Willamette students. We have endless opportunities to give students plenty of experience in some amazing prehistoric contexts and situations. This seems quite marvellous and surprising to some of the students to begin with and more than once I’ve heard the refrain “you mean you’re letting me dig this right now?(! )” — usually in relation to some beautifully decorated grooved ware pottery vessel that has appeared. Yes we do let them and, even if it is with good close supervision at times, it’s nevertheless true that the only way to learn field archaeology is to get stuck in and deal with “the real stuff”! And when it comes to the good stuff it’s just amazing having this site, this resource, available to the students, especially the beginners among the undergrads’ to cut their teeth on. Even the more experienced diggers among the postgraduate students are often still “gobsmacked” by the richness and substance of the Ness of Brodgar. 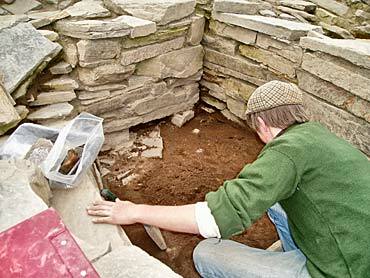 I’ll sign off now but having spoken just now of the students and the enjoyment that they seem to find in the excavation experience, I would like to take the opportunity to warmly invite any readers of this blog who may be interested in studying archaeology in a more formal capacity with us at Orkney College UHI and across the UHI generally, to contact myself or one of my colleagues on the archaeology staff to discuss things.